"Bank saving is useless." Such is the claim of the men and women we have met over the past few months in various locations across rural Tamil Nadu (South India). This is despite the Indian government's strenuous efforts to inculcate a “culture of saving” into the rural poor through a series of financial inclusion schemes. Are we to conclude that South Indian villagers are unwilling to save, incapable of planning for the future and attracted to wastefulness and extravagance, as various early 20th century British colonial reports pondered? 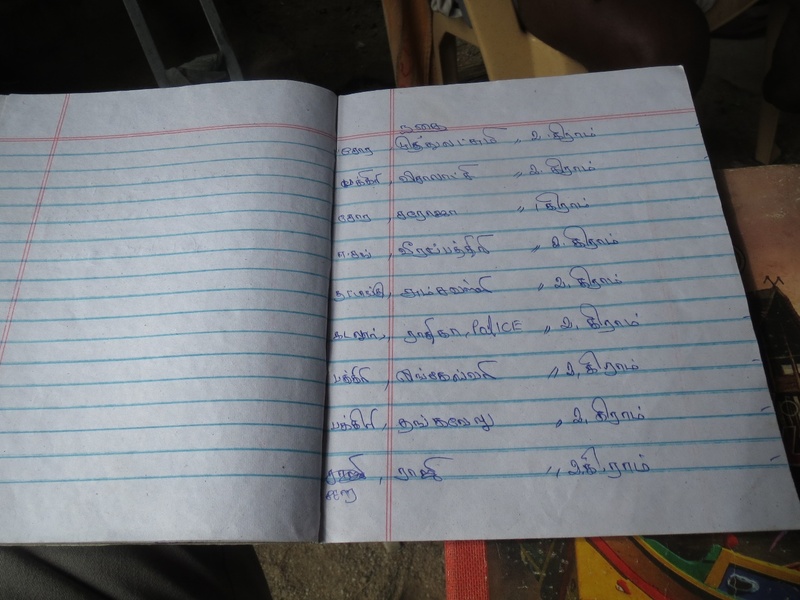 In rural Tamil Nadu today, most rural households have their own bank accounts, and various mechanisms have been set up to facilitate saving deposits, including business correspondents to provide doorstep services and digital finance. But bank deposit accounts remain desperately empty,1 while spending on social and religious ceremonies continues to rise. It seems that even with the demonetization, 2 bank deposits remain low for the rural poor. Although it might be tempting to jump to the same conclusions as the British colonisers and missionaries, this would miss the point. In-depth analysis of ceremonial transactions shows a different picture, and it suggests that ceremonial transactions should be considered as a specific form of saving: relational saving. By this we mean saving transactions that are both shaped by and constitutive of social relations. Savings are usually conceived of as money or wealth that is put aside to be used in the event of an emergency (including health crises, job losses, theft or floods) or to prepare for the future. But in Tamil villages, money and more broadly wealth are considered as something that must circulate. The two main purposes are material assistance - formal social protection is still the privilege of the few - and social status. People do save, sometimes even considerable amounts, but the very value of savings lies in constant circulation. If people find themselves with a cash surplus, it makes more sense to them to buy gold, as we have shown elsewhere, or even to inject that cash into their social network, for instance in the form of loans, or gifts that must be reciprocated later, most notably in the case of ceremonial gifts. Ceremony organizers keep precise accounts of gifts (see the picture below). 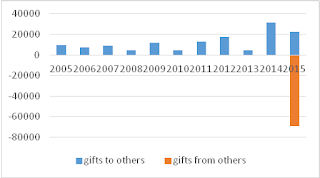 Counter-gifts are not strict equivalents, but are based in complicated logic that blends redistributive rules (the better-off or socially higher-up are expected to give more generously), reciprocity (among peers), and feelings and affection (notwithstanding rank, people often give more to persons in their close circle and those with whom they want to continue a relationship). Ceremonies and their notebooks play a key role in family calculations, long-term planning and saving strategies for various reasons. As events, ceremonies are concrete opportunities to display and give visibility to family status (mariyatai). Insofar as ceremonies involve individuals' and their families' whole relationship sets, and are largely funded by this same set of relations, they are both an expression of mariyatai and a means of building it. A ceremony's clout is measured in terms of guest number and ‘quality’, the food served, and gifts received: this all aims to maintain, or possibly upgrade or at least not downgrade the mariyatai of the organisers (and their kin). Ceremony costs can often seem puzzling, especially in comparison to incomes, but they are closely tied to the gifts expected (from invitees). This in turn depends on what gifts the organiser has previously given. This makes the broad set of debts and obligations contracted through ceremonies crucial to households' financial positions. Households' life-cycle positions, social networks and particular circumstances determine them to be net debtors or net creditors. Some households “save up” (gradually accumulating through regular gifts before organising their own event, see fig. 1 below), while others “save down” (organising an event and then slowly paying back), while others “save through” (a mix of the two). Fig. 1 below shows a household that regularly saved since marriage in 2005 through regular gift-giving in its social circle, getting this partly back for the daughter's puberty wedding. Parents with unmarried daughters most often "save down". Sivakumar is a typical example. He first organises the puberty ceremony of his daughter. This allows him to acquire 13 sovereigns 3 of gold to be set aside for her future wedding. He will regularly have to pledge them to cover various needs and hope he won’t lose them. He will “pay back" (this is the term used) in around ten years, roughly when his daughter gets married, which will put him back into debt for many years. We are not looking to idealise these practices. They both reflect and strengthen pre-existing inequalities on various lines. This is particularly true for gender inequalities, since the dowry counts as a significant share of wedding expenses and obviously contributes to women’s lower standing. This is also true for caste and caste inequalities, insofar as the style of upper castes and upper classes’ ceremonies tends to be the norm. Our point is that these dynamics and forms of logic cannot be ignored if we truly wish to design appropriate, fair financial services. For the moment, in the context of our study, the rural poor don’t use bank saving accounts because it goes against a vision of wealth as something that constantly circulates socially. Mobile money transfers, while still underdeveloped in rural South India, may have a more promising future. The key question is whether the technology of digital finance could be used to fight specific forms of inequalities. Whether we like it or not, digital finance is most probably going to pervade our daily lives, even in the remotest of areas. Further research is needed to ensure that, rather than being outstripped by such developments, we can think about a variety of ways of using them to support democracy and equality. 1 In our field area, bank account take-up was already widespread in 2010, with 91.2% households having a bank account. By 2016, take-up had risen to an even higher 97.5%. Much less had been achieved in terms of saving deposits however. The median amount remained unchanged (around 600 INR) and the average amount had even decreased (from 4470 INR to 2043 INR). Most bank accounts are in fact ‘dormant’ and mostly used as a channel for social benefits. 2 On the 8th of November 2016, the Indian prime minister has announced that 500 and 1000 INR banknotes would be invalid after midnight of that day. Citizens have until 30 December 2016 to tender their old banknotes at any office of the RBI or any bank branch and credit the value into their respective bank accounts. The objective is to combat counterfeiting, corruption and terrorism financing. 3 One sovereign is equal to around 8 grams of gold. It is the most common unit of measurement of gold in the region.